A lens under development at Ohio State University combines features of the insect eye and the human eye to achieve wide-angle views with depth. Photo by Jo McCulty, courtesy of Ohio State University. COLUMBUS, Ohio— A lens invented at The Ohio State University combines the focusing ability of a human eye with the wide-angle view of an insect eye to capture images with depth. The results could be smartphones that rival the photo quality of digital cameras, and surgical imaging that enables doctors to see inside the human body like never before. Engineers described the patent-pending lens in the Technical Digest of the 25th IEEE International Conference on Micro Electro Mechanical Systems. That is to say, the lens shows a wide view, but still offers a sense of human-like depth perception: as close objects come into focus, far away objects look blurry. 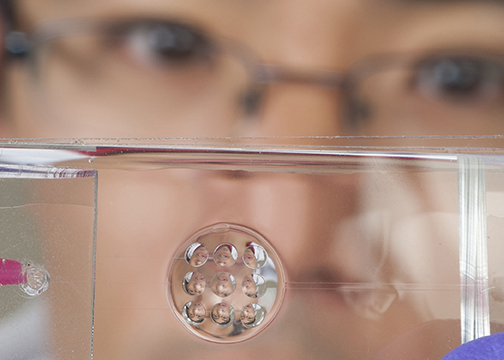 Zhao’s prototype lens is made of a flexible transparent polymer filled with a gelatinous fluid similar to fluid inside the human eye. It’s actually a composite of several separate dome-shaped fluid pockets, with small domes sitting atop one larger dome. Each dome is adjustable, so that as fluid is pumped into and out of the lens, different parts of it expand and contract to change the overall shape—and thus, the direction and focus—of the lens. This shape-changing strategy is somewhat similar to the way muscles in the human eye change the shape of the lens tissue in order to focus. It differs dramatically from the way typical cameras and microscopes focus, which involves moving separate glass lenses back and forth along the line of sight. The shape-changing lens could potentially offer the same focusing capability as multiple moving lenses in a single stationary lens, which would make for smaller and lighter cameras and microscopes. In particular, Zhao is interested in using the lens in confocal microscopes, which use a system of moving glass lenses and a laser to scan three-dimensional images of tiny objects. “We believe that it is possible to make a confocal microscope with no moving parts,” he said. In tests, Zhao and doctoral student Kang Wei demonstrated that the lens was able to switch its focus among microscopic objects arranged at different distances. In one test, they printed each of the letters in O-H-I-O on top of tiny platforms of different heights, and pointed the lens at them from above. The lens was able to focus on each letter in turn, while the others became more or less blurry depending on how far away they were. While the prototype worked well, its design wasn’t entirely practical, in that it required an external fluid reservoir, and the fluid had to be pumped in and out by hand. To make the design more appropriate for use in electronics, the engineers created an otherwise identical shape-changing lens from an electrically active polymer, which expands and contracts based on electrical signals. That lens has undergone initial testing, and the engineers have submitted a paper on it to an academic journal. With further development, the technology could be useful in laparoscopes for medical testing and surgery. With laparoscopy, doctors insert tiny wide-angle cameras into the patient’s body in order to see as much tissue as they can without cutting the patient open. But such lenses don’t offer a sense of depth: they show all objects—both near and far—in focus at all times. This poses a problem for doctors; if they mistake a close object for a far away one, they could accidentally graze healthy tissue with the scope or surgical instruments. “With our lens, doctors could get the wide-angle view they need, and still be able to judge the distance between the lens and tissue. 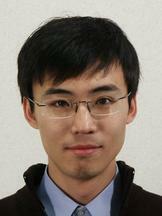 They could place instruments with more confidence, and remove a tumor more easily, for example,” Zhao said. The lens could ultimately find a home in smartphones. Because phone cameras don’t have moving parts, they use a “fixed focus” lens, which treats a scene the same way a wide-angle lens does: all objects are in focus, so depth is missing. Phone cameras can’t truly zoom in on objects, either. They just crop an image and enlarge it, which greatly reduces quality. With a shape-changing lens, a phone could potentially take pictures with the same depth and zoom as a more expensive digital camera. At 5 millimeters across, however, the lens is a little bigger than a typical smartphone lens, so Zhao and Wei plan to shrink the design. The university’s Technology Commercialization and Knowledge Transfer Office will license the technology to industry. This research was supported by graduate fellowship from the Howard Hughes Medical Institute and a Pelotonia Postdoctoral Fellowship from Ohio State’s Comprehensive Cancer Center. Editor's note: Images are available from Pam Frost Gorder.